Snapchat's latest feature, Context Cards aims to make the platform a hub for information sharing and discovery, thereby helping users stay informed on the popular social network. The Context Cards feature is also able to provide basic information about a restaurant or store nearby, with reviews and a map. The information sharing is made possible through a host of partners including TripAdvisor, Foursquare, Michelin, Goop, Uber, Lyft, OpenTable, Resy and Bookatable. And its accessible by simply swiping up on any Snap that says "More" to see the Context Cards, you'll be able to see travel tips and reviews on places near your location. 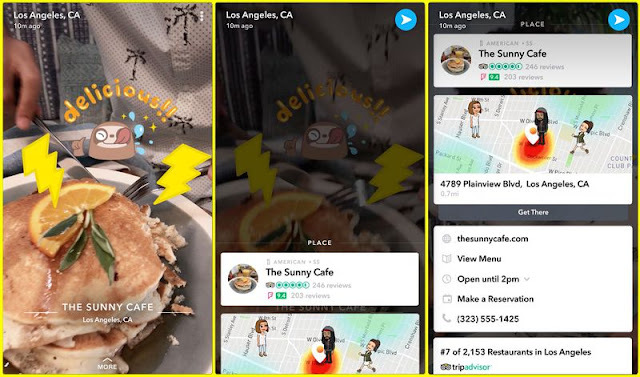 Albeit, some locations may have curated Snaps Stories integrated into their Context Cards, so as to allow you have an idea about the place when you're deciding on your preference. The feature will be quite handy in such instances like when you're out and about visit a new location, simply swipe to see reviews, hail a ride or make a reservation. The roll out of Context Cards for Snapchat on iOS and Android will begin with the U.S., UK and Australia, as well as Canada and New Zealand in the coming weeks.